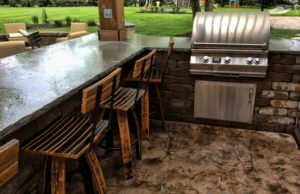 From barbecue pits to refrigerators to paver patios, we can build the outdoor kitchen of your dreams! In Des Moines, we love to use every bit of the warm and cool seasons that we can! 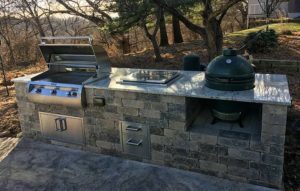 What better way to do that than with the perfect outdoor kitchen or barbecue station? Just as the entrance to your house is designed to draw you in, your lawn and landscape should welcome you outside! 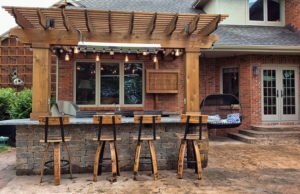 With a little planning and creativity, your backyard can have the perfect “outdoor kitchen” to bring you and your family outside. And just like its indoor counterpart, you can have a sink, counters, refrigerator…you name it! Whether you prefer casual cookouts or, who knows, maybe a black tie affair (you never know, right? ), any space can be transformed in to the perfect outdoor kitchen. Plan ahead. Consider how you want to use your property. Make a 5-year wish-list. If you can see yourself installing a pool, keep that in mind when planning your paver patio or kitchen space. Consider the view looking out from your windows. This is an area many people forget, but that’s the one you’ll see most often. For some of us, we love being able to see our BBQ grill from the comfort of our family room couch. For others? Maybe moving it a few feet to the left might be better. Plant now for privacy later. Landscaping elements make great screens for privacy and for noise reduction, but they do take time to grow. So, “planting ahead” is a good idea. Match the size of your outdoor kitchen to that of your indoor kitchen. For example, a patio might equate to a family room size, while the barbecue area might be the size of a kitchen-dining room combination. Making outdoor rooms too large takes away the feeling of intimacy, so it’s a great idea to take the time to plan your space. Continue colors, styles or even flooring from inside to outside, if possible, for a sense of connection. If you have dark brown hardwood floors, and the exterior of your home is also an earth tone, you’ll want to select a complimentary paver block patio or stained concrete finish. Think outside the (square) box. Remember, nature produces nothing in a straight line. Curves in walkways, pools and decks will look more natural than using all straight lines. It’s amazing what the “after” photos will look like when you go from square to curvy. Whatever the age of your family, your home, or your landscape, Des Moines’ Earthly Possibilities Landscaping can help you create the perfect backyard kitchen, right outside your window. Why not give us a call, at 515-577-6903, today to get started on your plan today?